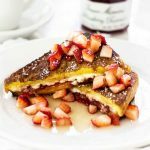 Thank you to Bonne Maman for sponsoring this post and providing the inspiration for this stuffed french toast recipe made with wholesome strawberry preserves. 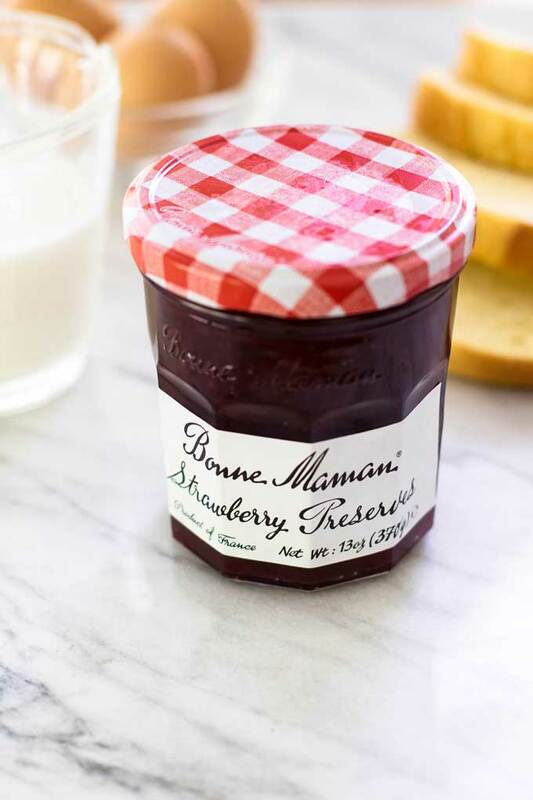 When Bonne Maman, makers of fine preserves packaged with an iconic gingham lid, asked me to share a Mother’s Day recipe with you all I accepted because making a Mother’s Day meal for mom is a cause I can get behind. Maybe it’s because cooking is my love language, but I believe a thoughtful home cooked meal, made with love and shared around a table, inspires connection and, on Mother’s Day, isn’t that what our moms really want? Except some of us don’t live near our moms making that whole “cook a meal and share it”concept a little difficult. So, we lean on a greeting card to make up for it. We’re the ones in the card aisle at the grocery store, scanning the display with a quiet intensity in search of the perfect card. One that encapsulates, in a pithy poem, everything we want our moms to know that we can’t quite articulate ourselves. One that makes up for the distance, but, in my experience, most of the options fall short so I leave with a good-enough card. And the card I’ll send my mom this year will travel exactly 1,701 miles from my house to hers. It’s a distance that’s somehow felt bigger during this past year that’s been pockmarked with personal challenges. We make up for the miles between us with frequent phone calls, emails and text messages, but with Mother’s Day around the corner that separateness feels all the more real. But, she’s making plans to visit next fall and when she does I’ll pull this stuffed French toast recipe out and make it for her. She’ll protest, worried that I’m going to too much trouble. I’ll assure her I’m not and we’ll sit at my little table with the red chairs, mugs of hot coffee in hand and plates of stuffed French toast dusted with powdered sugar and a drizzle of syrup. We’ll fill the kitchen with our mother-daughter chatter and, after we’ve scraped our plates, she’ll insist on loading the dishwasher and I’ll pour us another cup of coffee. I’ll send a card next week, but this year we’ll celebrate Mother’s Day in September. 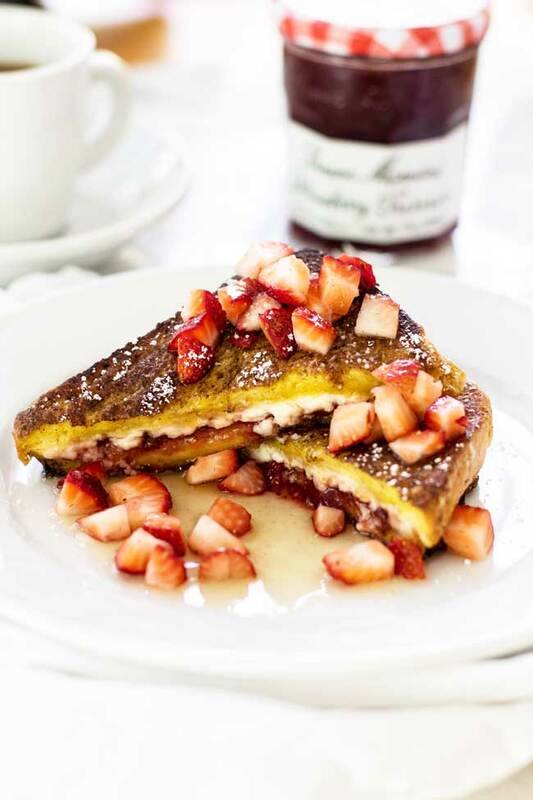 This stuffed french toast made with soft slices of brioche, cream cheese, and strawberry preserves serves one and it’s the sort of thing that looks pretty on a tray along with a glass of fresh orange juice and a single flower in a vase. It conjures up the quintessential breakfast in bed image or what you might order at a countryside B&B. And while it might look high maintenance, it’s as easy as making a sandwich, a sweet sandwich that’s dredged it in a simple mixture of egg and milk before it’s lightly fried it in a pan coated with a thin layer of butter. Fresh strawberries, powdered sugar and syrup top it off. 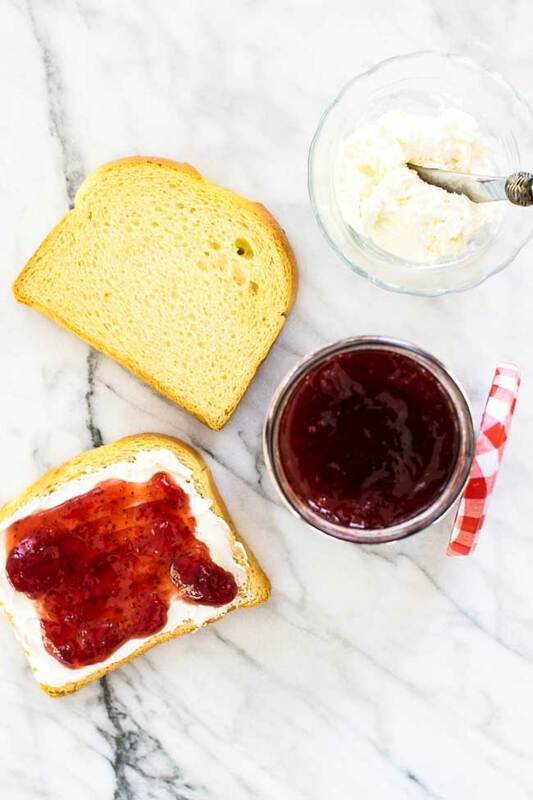 Brioche bread stuffed with strawberries preserves is a delicious way to make French toast for special occasions. Calories do not include powdered sugar or syrup. not a big fan of sweets but love the idea. That strawberry looks delicious – great pictures! This looks like the best brunch ever! 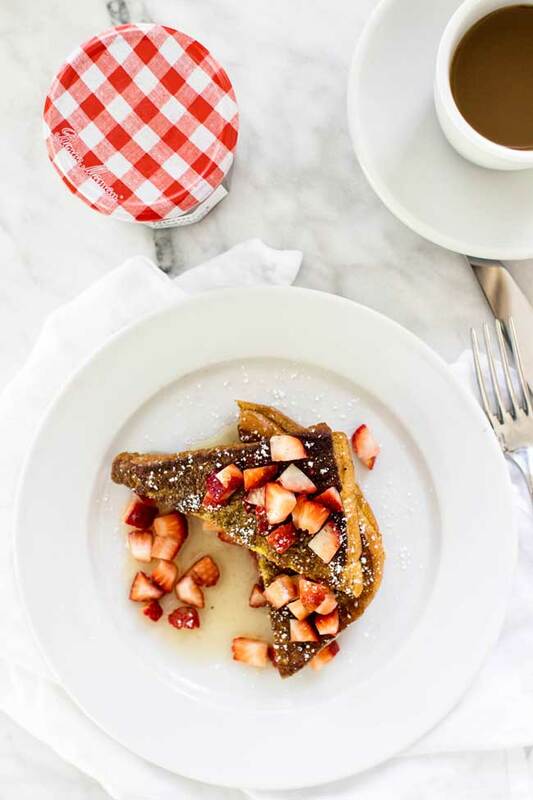 I think every day would be a good day if I could start it off with this french toast. So pretty and sweet and perfect!